PA chairman is trying to recruit Arab leaders to convince Trump not to recognize Jerusalem, but they are not cooperating. 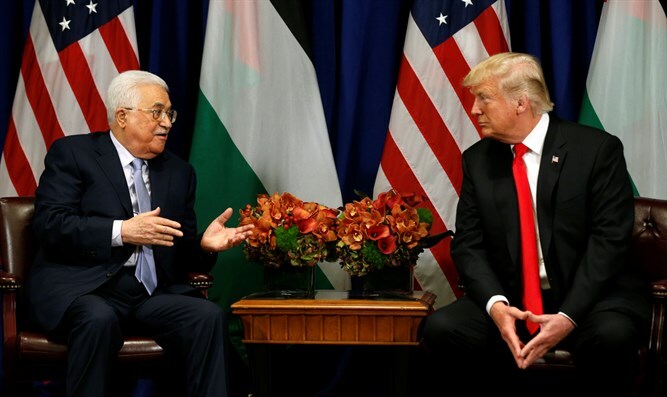 Palestinian Authority (PA) chairman Mahmoud Abbas has been waging a battle against U.S. President Donald Trump's intention to recognize Jerusalem as the official capital of the State of Israel but appears to be having trouble recruiting Arab leaders to the cause, Hahadashot (formerly Channel 2 News) reported Sunday. According to the report, Abbas has been calling all the leaders of the Arab and Islamic region and asked them to convene an emergency meeting of the Arab League. Despite his appeals, however, the leaders of the Arab world are not cooperating with him. The only one who expressed willingness to help is Turkish President Recep Tayyip Erdogan, who is trying to prevent Trump from going through with the move. According to the report, Hamas politburo chief Ismail Haniyeh spoke on the phone with Abbas and the two agreed that the Palestinians should demonstrate against the American decision to recognize Jerusalem as the capital of Israel. Trump is to decide by Monday whether he will sign the waiver delaying the move of the U.S. embassy from Tel Aviv to Jerusalem, and it has been speculated that he may prefer to declare American recognition of Jerusalem first and wait before moving the embassy. Trump’s son-in-law and senior adviser, Jared Kushner, addressed the issue on Sunday, and indicated that Trump has yet to decide whether or not he will renew the security waiver or if he will authorize the relocation of the embassy. "All reporters have called saying they have inside sources and they know what his position is,” joked Kushner who spoke at the Saban Forum in Washington. "The president is going to make his decision. He's still looking at a lot of different facts, and when he makes his decision, he'll be the one to want to tell you," he added.